The last roses of the season are blooming before the cold weather sets in. It’s finally time for hot tea, homemade scones, and the final finishing touches on this year’s natural medicine cabinet, which by the way include said roses. You may have heard me lavish my undying affection on rose before and I’ll tell you right now, there’s more to come. Rose is an incredible relaxing nervine. It’s anti-inflammatory and sedative. It’s perfect for burns, minor wounds, sore muscles, stress, grief, seasonal affective disorder, and just good for uplifting the soul. Can anyone truly feel sad when smelling a rose? 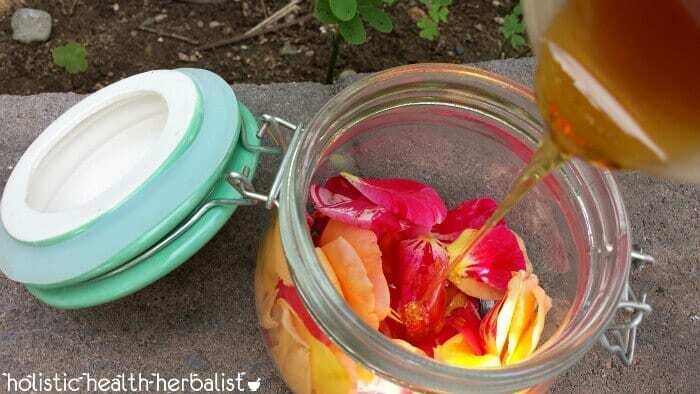 Their aroma alone can help heal heartsickness and ease depression allowing the heart to open and let the light in. I also love using rose to relieve PMS due to its ability to restore emotional equilibrium. One of my favorite ways to use rose is by eating it. It may sound strange but I assure you rose has a delicious delicate flavor that is both mildly sweet and floral. Fresh rose petals drenched in honey is the perfect companion for teas, over toast, yogurt, oatmeal…the list goes on. You can have your own Downton Abbey style tea party because this stuff is fabulous and classy! 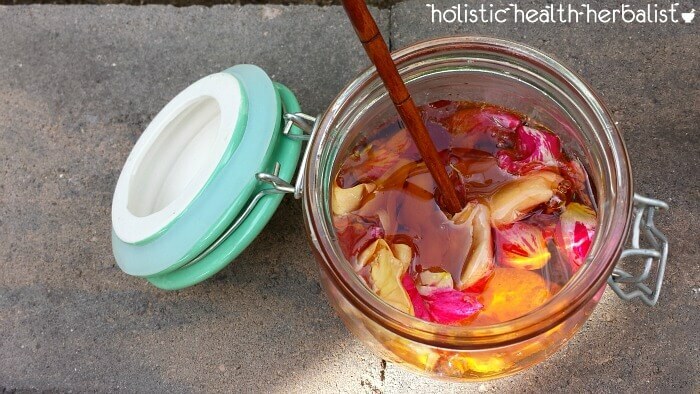 Making rose petal honey is super simple. All you need is fresh rose petals and a light local honey. Keep in mind- and this is very important- that the rose petals should never be sprayed with any chemicals or pesticides. You don’t want that stuff in your rose honey. The next thing you need to do is make sure that the roses smell very fragrant. The stronger the better! This is where the flavor comes from so I can’t stress this enough. The best time to forage rose petals is just after the morning dew has evaporated from the petals. This is when their fragrance is strongest. I have to be honest though, I have foraged fragrant petals at all times of the day and haven’t noticed much difference. 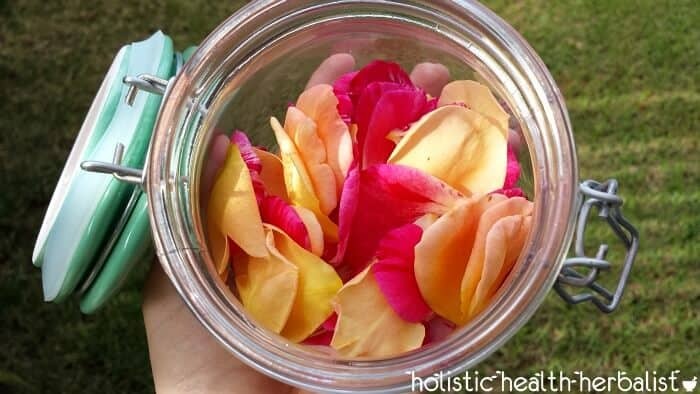 Once you have found the best fresh rose petals you can, start picking! The amount of rose petals you need largely depends on the amount of raw honey you have on hand. I didn’t have very many petals or much honey left so I had to eyeball it. The most important thing to remember is that you must be able to cover the petals completely with honey to prevent spoilage. Alrighty! Let’s get to it. 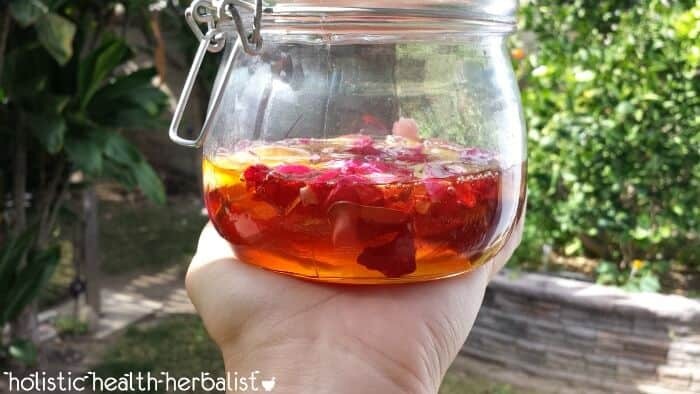 • Your rose honey is now ready to use! [yumprint-recipe id=’88’]This honey is a great way to help you eliminate some of the refined sugars in your diet. Rose infused honey is the perfect addition to iced teas and drizzled over your favorite treats. I really hope you give it a try as it’s kitchen medicine at its best! Facial Oils not Working out for You? Rose Water can Help! What are some of the specific ways you use this honey? From the article it sounds as though you consume this both over food and in beverages but also you use it topically? I’d like to know more about it’s topical applications – the how and why of it….? This sounds lovely. I have never heard of rose petal honey, but I’m sure it is wonderful. I wish I had known about this when we still lived near our in-laws, who have rose bushes. Oh I majorly doing the seasonal affective disorder thing – I think I need to try this! This is such a great way to use rose petals! I’m starting to get into herbal and infused honey, so this recipe is a great find for me. Thanks! This is so lovely! I bet the flavor is amazing! I wish I knew someone who was growing roses right now (without anything sprayed on them) so I could make this. Somehow, I don’t trust the roses you’d get from the grocery store or even the flower shops. I bet this will be lovely to have around for Valentine’s Day desserts!